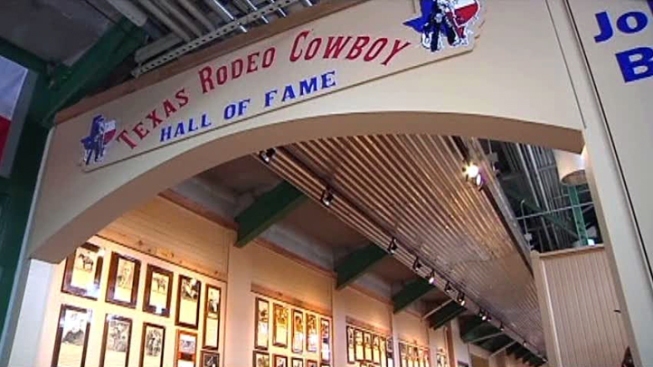 The Texas Rodeo Cowboy Hall of Fame has opened its doors inside the Cowtown Coliseum. The Fort Worth Stockyards have a new feature to brag about these days: the Texas Rodeo Cowboy Hall of Fame. The Cowtown Coliseum, which has hosted rodeos since 1908, is now the Hall of Fame's permanent home. It moved from Belton and opened its doors Friday morning just in time for the weekend's induction ceremonies. "The Cowtown Coliseum has been having rodeos for more than 100 years, and we're honoring our heroes, our legends of rodeo," said Kirk Allmon, a board member for the hall. "And what better fit than the Cowtown Coliseum and the Texas Rodeo Cowboy Hall of Fame?" Several past and present inductees checked out the plaques and halls on Friday, including Tex Martin, 81, who was inducted in 2000. "Half the people on the wall here I rodeoed with," he said. "I think it's great. It's been a long time getting here, and I'm glad it's here." Martin's brother Clyde is also in the hall; he was inducted in 2006. "You can stop by any time you're in Fort Worth," Tex Martin said. "You don't have to worry about where it is. Oh, I think it's great; they finally got a home." The hall is inducting 43 people, among them Billy and Pam Minick as Rodeo Couple for 2011. While perhaps best known for running Billy Bob's in the Stockyards these days, the Minicks are no strangers to the rodeo. "We team rope together," Pam Minick said. "He helps me when I go to a roping; I help him when he goes to a rodeo. So, to be inducted as a couple really is fitting." Induction ceremonies will take place Friday night and midday Saturday.